Disclosure: There is no actual science involved in this post, just my humble opinion based on self-diagnosis. Consider it a Pseudoscience Friday. Before every marathon, once I get deep into the taper, I become obsessive compulsive about checking the weather. (And don't get me started on the hand washing. *) Ten days out weather.com will begin posting its forecast. Ten days is too far out to ever be correct about the forecast, and so it will almost certainly change as the day gets closer. But no matter. As soon as possible, I'm on that site checking for the stats: heat? cold? rain? sun? A couple hours later: any difference? The hard training is done. The carbo-loading has yet to begin. There isn't much else I can do to be any more prepared for the race. Except keep going back to weather.com to find out what the day will bring. Weather is the most frustrating thing because it's the one thing we can't control. We can train like never before, rest well, eat well and show up to the race ready to PR. But if the weather doesn't cooperate, all that can be wasted. Even a seemingly slight deviation of ten degrees from ideal marathon temperature (50 degrees) in either direction (down to 40 or up to 60) can increase your time by 1.5-3%. (Adding between ~3-6 minutes to a 3 hour marathoner's time.) Then there's rain, wind, humidity, snow... the possibilities for a less than perfect day seem endless. There are some ways to prepare. If you know you are running a hot race, for example, you can acclimate yourself to running in hot temperatures. You can lower your body temperature before the race with precooling vests or frozen drinks. But you need to do this in your training, weeks and months before the race. If you don't see it coming, if race day turns out to be much hotter than usual, it's too late for these kind of adjustments. So why would you even want to know? I want to know to get rid of the element of surprise. I don't want to be surprised by anything on marathon morning. Even if I can only know the weather a few days before hand, I want to make any adjustments possible. Heat scares me the most. I do not like running in the heat and I don't handle it well. 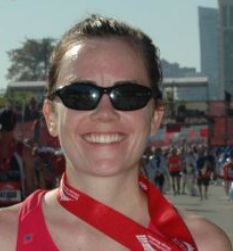 In Chicago 2010, I ran on a humid day with temps around 85. I shouldn't even be complaining, because it was nothing compared to the infamous disaster of Chicago 2007. But the heat crushed me and I ran 15 minutes slower than I thought I would. I went out too fast and literally melted at the halfway mark. In 2011, I decided to go back to Chicago for redemption, and once again, my pre-race anxiety rose along with the predicted temperature. But this time, I was more prepared. I had trained in the summer heat, I drank a prerace slushie (which has been shown to lower your core temperature), and Rusty was on the course to hand me ice soaked sponges. I didn't start off too fast, and held myself back in case the weather reared its ugly head. When it didn't, I was able to stay strong and finish in a new PR. I think some would argue the added prerace anxiety of checking (and freaking out over!) the weather would be a bad thing. But I would argue that, for me at least, it's better to be prepared. Even if you only know a few days out, you can adjust what you're wearing, how much you're drinking, and, if need be, your expectations. I think knowing what I was in for helped in last year's Chicago, and I hope it helps this time. 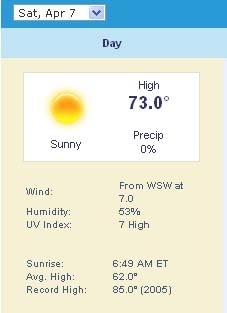 So here we go: as of this morning (8 days away): sunny and a high of 73. I am not so happy about that 73, but Charlottesville does start at 6:30 am (!!!) While that's an issue for other reasons, it's good on a warm day, as it will ensure a cooler start and hopefully a finish before it gets too hot. But I'll be watching weather.com all week, hoping my incessant checking will make that temperature drop. And hoping no one notices, or I really will be diagnosed with OCD. And I'll be proving my own OCD by checking this blog at least half a dozen times over the next few days to make sure all is well with you! May the winds of NJ blow down to Virginia to push the temp down... and may all that happen on Thursday or Friday so they are gone before the race! Future "Science Friday" topic idea: carbo loading...facts and myths.